I am using Windows 7 Mobile. Whenever one of the contacts from my mobile made a call to me, their name is not visible on my Screen, even though I have their number along with name in the Contacts. Please, help me in Solving the Problem. If your list is especially long, search is probably the best way to find something. On Start, tap People . Flick to All, tap Search , and then start typing someone's name. The list will filter as you type. Try using your voice to make a call or send a text—no need for scrolling or searching. Press and hold the Start button on your phone. Say "Call" or "Text," and then say the contact's name. 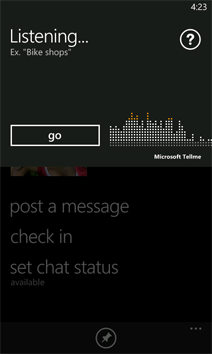 You can even dictate a text message. When you open Speech, your phone starts listening for a voice command. By default, contacts from the accounts you've set up on your phone will appear in your contact list. 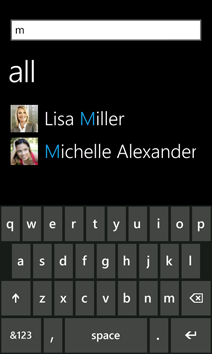 However, you can filter the list to show contacts only from the accounts you choose. Filtered contacts don't show up in your list, but they're still on your phone—you can get to them using search. On Start, flick left to the App list, and then tap Settings . Tap Filter my contact list, select the accounts from which you want to show contacts, and then tap Done . On Start, flick left to the App list, and then tap Settings > Applications > People. Tap Only show posts from people visible in my contact list. Posts from the social networks you've filtered out of your contact list will no longer be visible in What's new in People. On Start, tap People . Flick to What's new, tap All accounts, and then tap the account you want to view posts from.